Why rent a car in Madeira? Madeira is a great destination to discover by car. From capital Funchal to little villages, rocky beaches, and impressive mountains, having your own wheels is the best way to see it in its full diversity. Madeira Airport: Named after the living Portuguese football legend Cristiano Ronaldo (whose statue greets the arriving visitors), Madeira Airport is served by more than 40 airlines that connect the island to destinations in mainland Europe. Porto Santo Airport: The second and much smaller airport of Madeira, serving the island of the same name, has regular service to Madeira Island and Lisbon, as well as summer flights to and from Germany, Belgium, and the United Kingdom. An island archipelago in the Atlantic Ocean, Madeira is an autonomous region of Portugal. Its population is nearly 300,000 people. The largest city and capital is Funchal. 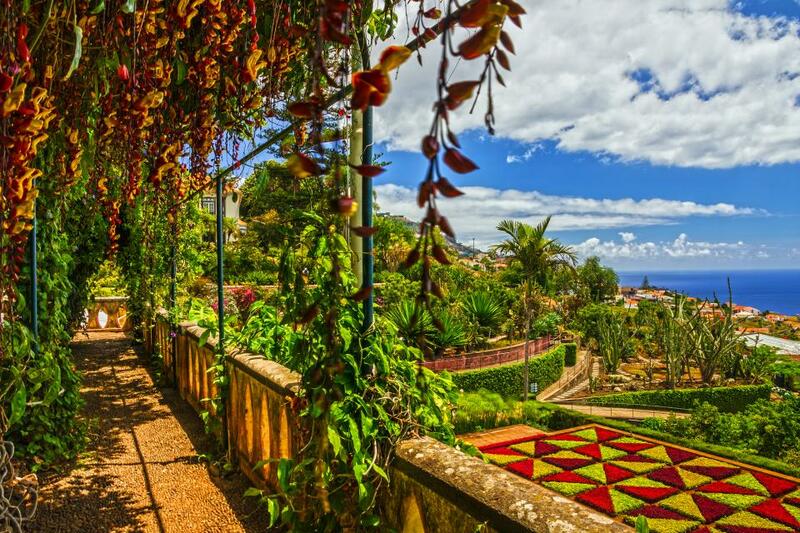 Madeira enjoys much warmer climate than continental Portugal. The summers are hot and very dry. Even in winter, the temperature rarely drops below 15 (60) °C (°F). Despite that, it’s not rare for snowfall to occur in Madeira mountains. Porto da Cruz. The small and cozy village on the Atlantic Coast that lives in the shadow of Penha da Águia (the Eagle Rock) boasts regional museums, a rum factory, mountains for hiking, and impressive surfing waves. Calheta. Calheta is most famous for its sugarcane museum and visiting here can be easily combined with seeing the two neighboring fishing villages, Paul do Mar and Jardim to Mar. You can only enter the roundabout after giving way to cars already on it. The car documentation and insurance always has to be inside a vehicle. Drivers can only use a mobile phone if it is a hands free or an earpiece. The legal alcohol limit is 0.05% for experienced drivers and 0.2 for novice drivers. Safety cameras are in use. When parking in a street, your car must be parked facing the direction of travel. There are no toll roads in Madeira, but there are quite a few in mainland Portugal. See the official website for maps and prices. Ponta de São Lourenço. This nature reserve is where unique plants like the Ice Plant and the Cardoon have found their home. Those who dare to climb the steep mountain paths and the volcanic rocks will be rewarded with impressive ocean views. Ribeiro Frio Natural Park. Another nature reserve, Ribeiro Frio can be best explored by walking its levadas or nature paths. The only human activity here is the trout farm that you can visit. Porto Santo. The ferry to Porto Santo Island takes about two hours from Madeira Island, but is well worth the trip. The cozy Vila Baleira is the only human settlement on the island, so there are plenty of opportunities to enjoy the island’s wild beaches and private atmosphere. The most popular rental cars in Madeira are the VW Polo, the Ford Fiesta, and the Fiat 500. The most popular rental car types are economy, mini, and compact. Azores. Even further out in the Atlantic Ocean than Madeira and lying nearly half-way between Europe and North America, the 9 Azores islands offer even more dramatic mountains, volcanoes, and beaches. Lisbon. Easily reached by a number of flights every day, Portugal’s first city is one of the most fun, colorful, and relaxed capitals of Europe. Porto. Full of history and unique atmosphere, Porto is a fascinating city to explore for days, although you might be tempted to visit the surrounding Northern Portugal region as well. Visit on the month when the rental prices are the cheapest. According to our data, visiting Madeira is the cheapest in January when renting a car is about 65% cheaper than the yearly average. Which is the cheapest month to rent a car in Madeira? Car rental prices in Madeira vary a lot according to the time of year. This graph compares month-to-month price changes to help you find the best offer. The best month to rent a car in Madeira is January (when prices for an Economy class start from $14.10). This is 65% cheaper than the yearly average and 81% cheaper than renting in November (when rental prices start at $72.95 for a Compact class). Knowing this can help you find the best price. What’s the usual rental length in Madeira? Travel lengths vary from month to month: in August, travelers rent a car for an average of 8 days in January, the average rental period is 6 days. What's the most popular month to rent a car in Madeira? While travelers visit Madeira year-round, the most popular month for renting a car is January, and the least popular is September. Hiring a car makes it a lot easier to visit places, and there are a lot of places to see in Madeira. Make sure you hire a car with a decent powered engine. Hills are very steep and you'll need the power. need to hire a car to go around especially with young kids as the road is so bumpy and difficult to drive. auto car is advisable . You need to be reasonably confident in driving and not intimidated by the driving style of many Madeirans who enjoy speeding on the roads and tend to overtake when not expected! A great place to drive but not for the faint hearted, great fun. Madeira is a beautiful island and hiring a car certainly helps to see it more fully. However, the very steep and (inland) narrow roads make driving a challenge and probably not for the more timid and cautious driver!! Who needs to spend more than a couple of days in Madeira I would recommend to rent a car to visit the island landmarks. It is a terrific place, very well adopted for tourists. Get more powerful car with bigger engine or diesel with bigger turgue. There are some streets so steep you might never experienced before. It is not a joke. Madeira is a piece of heaven that fell on earth. Visited several places; including Camera de Lobos, Porto Muniz, Ponta do Sol, Calheta, Sao Vicente, Ribeira Brava, Santana, Machico, Santa Cruz and Funchal. All these have their own aura and if you are planning to visit Madeira, you must go site seeing all the above. There is fine dining everywhere you go. The food is great and inexpensive. If you are a wine lover, you couldn't be at a better place. Every glass of wine I tasted was great. I wanted to experience the local life, so I never asked to see a wine list. I just asked for a glass of the house wine, red or white it met my expectations. Here in the U.S, a glass of wine will cost you between $6 to $8. In Madeira it will cost you between two to three Euros. With a little planning you don't need to rent a car the entire time you there. Rent a car to go site seeing and once you are done with it, assuming you are staying in the downtown area, walking is the best way to absorb the sites and sounds of the Island. Funchal is a lively place, restaurants at every "beco" and corner. The architecture is fantastic and the people are happy and friendly. We loved this place so much that my wife and I are talking about retiring there.